Light bounces off of everything. That light is then gathered by the cornea, the clear front window of the eye. Pictures from your world then pass through the pupil, a hole in the center of the colored, circular part of your eye called the iris. Its path is then refined by the crystalline lens. This lens changes shape to add magnification to the eye when you focus on something closer than twenty feet away. Finally, the image from your world is focused on the retina where it is turned into electrical impulses which pass to the brain where they are interpreted as vision. and focus on the retina on the left. 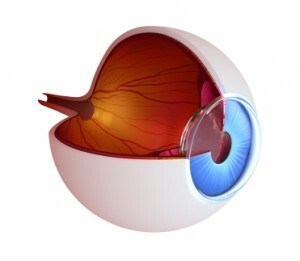 This is an obvious simplification of a complex interaction between many components that result in the miracle of sight. The slightest disruption to the harmony between the orchestrated interaction of all these components can have a profound impact on your ability to appreciate the world around you. What follows are explanations of what can impact the quality of your sight inside your eye.